On Saturday July 30, more than 1000 young people from across the region and beyond gathered on the campus of the Catholic University of America in Washington, D.C. for an event billed as, “Kraków in the Capital.” The day-long assembly occurred in spiritual union with more than one million fellow Christians who celebrated World Youth Day with Pope Francis in Poland. World Youth Day is an annual congregation of young adults hosted by the Catholic Church. This year, the host city was Kraków, Poland, the one-time home of Saint John Paul II. John Paul II – who was canonized in 2014 – initiated the first World Youth Day during his pontificate in 1985. 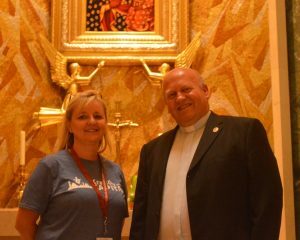 The Archdiocese of Washington partnered with Washington-area Catholic entities and the regional (arch)dioceses to host a state-side celebration of World Youth Day in Washington. The event afforded numerous opportunities for participants to come together and pray, and also hear talks from bishops and national speakers. Sweet paczki (Polish donuts) were one of the delicious treats on tap at Kraków in the Capital. Planners offered a full slate of catechesis (religious instruction) for everyone who attended, including sessions in Spanish, and help for those who are deaf and persons with intellectual disabilities. An exhibit hall provided participants even more information about religious vocations and local and national Catholic organizations. To proffer a taste of the cultural experience that was occurring abroad, the festival included Polish dance, music and food. 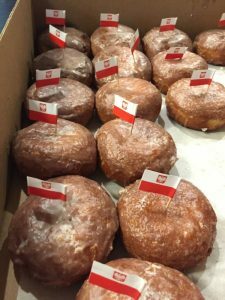 Danuta Konefal, who owns Creative European Cooking, made around 3,000 pierogies for the event, while the congregation of Our Lady Queen of Poland and Maksymiliana Kolbe donated sweet paczki (Polish donuts) as a part of desert in Pryzbyla Hall. And the Ojczyzna Polish Dancers – a Polish dance group from Baltimore – led polka dancing lessons for event goers. In his opening welcome at the Basilica of the National Shrine of the Immaculate Conception, Jonathan Lewis – Director of Evangelization, Youth and Young Adult Initiatives for the Archdiocese of Washington, D.C. – reminded the pilgrims that choosing the country of Poland was an especially significant location for this year’s World Youth Day. Also speaking during the welcome ceremony were Fr. Frank S. Donio – Director of the Catholic Apostolate Center and Provincial Rector of the Immaculate Conception Province of the Society of the Catholic Apostolate, and Cardinal Donald Wuerl, Archbishop of Washington, D.C. Cardinal Wuerl would later preside over a candlelight Stations of the Cross, before celebrating a vigil Mass at the National Shrine. Underscoring the successful and wide-reaching nature of the event were one Polish immigrant and three 30-something participants we spoke with between the catechesis sessions. Polish pilgrims Bozena Lis and Father Robert Nalepka in the Chapel of Our Lady of Czestochowa. The chapel is located in the Upper Church of the Basilica of the National Shrine of the Immaculate Conception. Bozena Lis, from Rockville, Maryland, was delighted with the Polish connection. She was especially grateful she could share the event with her pastor: Father Robert Nalepka from Poznan, Poland. Bozena told the Baltimore Post-Examiner that Father Robert has very positive feelings about Kraków in the Capital – World Youth Day. “It is a good idea for connecting with young adults here in D.C. since Pope Francis is in Poland. Father Robert is happy that he could be a part of the World Youth Day and said the best part was praying The Chaplet of Divine Mercy in 5 different languages – Polish included. It made him very spiritually happy because St. Faustyna is his favorite saint. 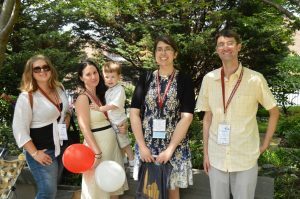 Event goers Mary Bonk, Katherine Hunter, Gabriel, Monica Kassab and Christopher McAvoy. Editor’s note: This is the eleventh part of an ongoing series which will look at the places and people that make up the rich history and diverse nature of spirituality, belief, and observance in Baltimore and beyond. Read the series here.